I first became aware of the Mithraic Mysteries in the early 1960s, when I took two seminars given by the well-known MIT professor of the history of science, Giorgio de Santillana (1902-1974). At that time I was a very young college undergraduate who had been fortunate enough to convince Professor de Santillana that I should be permitted to take his seminars, which were usually reserved for graduate students only. At that time, Professor de Santillana was at the peak of his intellectual powers; in 1961 he had published what I believe was his finest book: The Origins of Scientific Thought from Anaximander to Proclus, 600 B.C. to 500 A.D. He was a good lecturer and was even better in the give and take discussions of the seminar room. A great deal of reading and essay writing was required, but it was very interesting to me and I enjoyed making the necessary extra effort. The main focus of the course was on the early Greek philosophers, who flourished from about 600 to 300 B.C. Professor de Santillana took the position that they had been extremely important in laying the intellectual foundation for the European scientific revolution of the 17th century. We only spent a day or two in discussing the Mithras cult and its significance to the philosophical and astronomical thinking of the Roman Empire. Even so, I do recall at least some of his ideas regarding the connection between the main Mithraic myths and the astronomical knowledge of the time. Many years later, in 1970, I acquired a copy of his last book, which he had co-authored with Dr. Hertha von Dechend (1915-2001) entitled: Hamlet's Mill, An Essay on Myth and the Frame of Time. Unfortunately, I was more than a little disappointed in the lack of clarity and poor organization of the book. His main thesis was one which he had also expressed during his seminar; unfortunately, this published work lacked both focus and clarity. I later found out that Professor de Santillana was in failing health at the time and that most of the chapters in the book had really been written by his younger but less well organized colleague. * One area of almost total omission was a discussion of the Mithras belief system, even though this belief system was almost overflowing with astronomical/astrological ideas. Indeed, there was only one reference to Mithra (Mithras) which appeared on pages 263 and 264 of the book (see quotation cited in the Introduction Section). 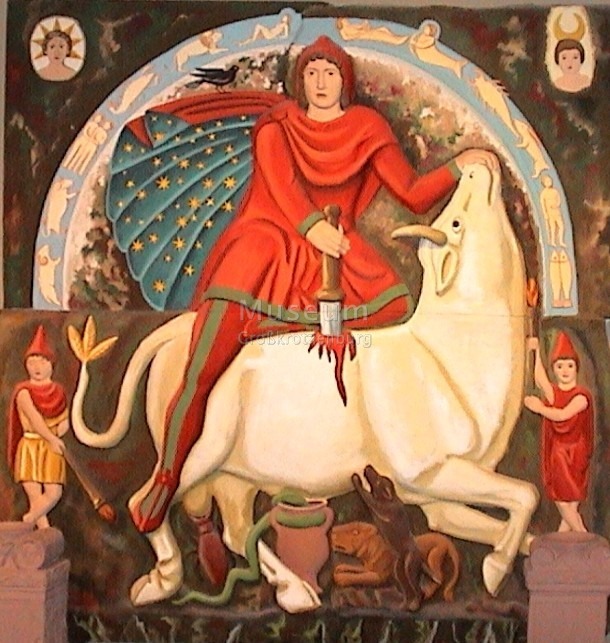 I have recently renewed my interest in the Mithraic belief system after reading the online, current edition of the Rosicrucian Digest; the entire issue is devoted to Mithras. The purpose of this website is to discuss my ideas concerning this rather strange mystery school and also record the ideas of Professor de Santillana on this subject, to the extent that I am able to recall them. It is to the memory of Giorgio Diaz de Santillana that I dedicate this website. * By my reckoning, only six of the 23 chapters were written or mostly written by Giorgio! "It will help now to take a quick comparative look at the different "dialects" of mythical language as applied to "Phaethon" in Greece and India. The Pythagoreans make Phaethon fall into Eridanus, burning part of its water, and glowing still at the time when the Argonauts passed by. Ovid stated that since that fall the Nile hides its sources. ... This is the "birth" of the valid representatives of both the poles, the sons of Mitra and Varuna and also of their successors. To follow up the long and laborious way leading from Rigvedic Mitravaruna to the latest days of the Roman Empire where we still find a gloss saying "Mithra funis, quo navis media vincitur" - "Mithra is the rope, by which the middle of the ship is bound," would overstep the frame of this essay by far. Robert Eisler relying upon his vast material, connected this fetter of "rope," Mithra, right away with the "ship's belt" from the tenth book of Plato's Republic." -- Giorgio de Santillana and Hertha von Dechend, Hamlet's Mill (1969), pages 263-264. Giorgio de Santillana and Hertha von Dechend, Hamlet's Mill: An Essay Investigating the Origins of Human Knowledge And Its Transmission Through Myth (1969). Giorgio de Santillana, The Origins of Scientific Thought; from Anaximander to Proclus, 600 B.C. - 500 A.D. (1961). Porphyry, On the Cave of the Nymphs (First Published - Late 3rd century A.D., Thomas Taylor Translation - 1823). David Ulansey, The Origins of the Mithraic Mysteries (1989). Manfred Clauss, The Roman Cult of Mithras (German Edition - 1990, English Edition - 2001). Peter Levenda, Stairway to Heaven (2008). Jane B. Sellers, The Death of Gods in Ancient Egypt (Revised Edition - 2007). Friedrich Nietzsche, The Pre-Platonic Philosophers (English Language Edition - 2001). Walter Cruttenden, Lost Star of Myth and Time (2006). Marvin W. Meter, Editor, The Ancient Mysteries (1987). Franz Cumont, The Mysteries of Mithra (1903). Google Maps - Map of the Locations of Mithraic Sites. Journal of Mithraic Studies - Online. Mithras: All the Passages in Ancient Texts that Refer to the Cult - Online. Rosicrucian Digest, The Mithraic Mysteries, Volume 88, Number 2, 2010. Sir Norman Lockyer, The Dawn of Astronomy (First published 1894, MIT Press Edition 1954). I currently support twenty-four websites. Fifteen sites are related to philosophy and art and nine are related to genealogy and local history. Hyperlinks to those sites are shown below. All Rights Reserved. Published in the United States of America. My essays and other narratives, provided at this web site, may be reproduced for nonprofit personal or educational use only. Any commercial use of these materials is a violation of United States copyright laws and is strictly prohibited.